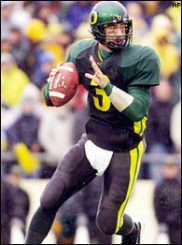 Back before Marcus Mariota, Darron Thomas, and even before Dennis Dixon, Oregon had another famous quarterback or two. Of this lot, only Joey Harrington had Oregon’s interest from birth. Born to former Oregon quarterback John Harrington, Joey’s potential was recognized immediately by his dad’s old head coach Len Casanova. Casanova sent his congratulations to his former quarterback on becoming a father with a letter that was jokingly written as a letter expressing his interest in signing Joey – 18 years later, Joey accepted a similar offer from coach Mike Bellotti. In his sophomore season Harrington got his shot to fight for the starting job, replacing Akili Smith who went into the NFL draft. His competition was junior quarterback AJ Feeley, a man who had much more raw arm talent than Harrington and similar accuracy. Despite a close race, Feeley wound up winning the job on the field in a strong performance against Michigan State. Feeley kept the job through a few more games, blowing out cupcake opponents Texas-El Paso and Nevada and winning a triple overtime game against USC. The following week Feeley injured his elbow in a loss to Washington. After another close loss to UCLA, in which his injury was likely to blame for an underthrown pass that could have won the game, he lost the starting job to Harrington. 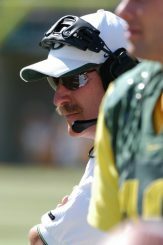 After taking the job, Harrington led the Ducks to five straight wins to close out season, culminating in the team’s first Sun Bowl appearance since 1963. In that game, Harrington ran for two TDs and threw for a third, in what would be the first of three straight bowl victories for Oregon and Harrington. Oregon started Harrington’s junior season with a win over outmatched Nevada before being brought back down to earth by Wisconsin in a 27-23 loss. Harrington and the Ducks went on to win their next eight games, including a 56-55 marathon against Arizona State, a game where a few lucky bounces and Harrington’s greatest Captain Comeback magic led them to a double-overtime victory. 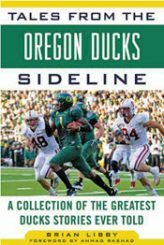 Although the Ducks lost the following week to the Oregon State Beavers, in the only Civil War game to feature both teams ranked in the top 10, they still qualified for the Holiday Bowl where they faced the No. 12 ranked Texas Longhorns. The Holiday Bowl was an unusual game that featured Harrington catching a touchdown on a trick play as well as Oregon deliberately giving the other team a safety to get better field position. Ultimately Oregon prevailed over the Longhorns in a 35-30 nail biter. 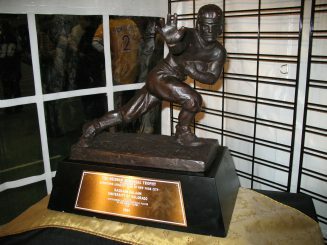 Before there was Johnny Football, there was Joey Heisman. Oregon began the season by winning 9 of their first 10 games, some in typical Captain Comeback fashion and some in blowouts against cupcake opponents. Harrington and the Ducks went into the Civil War in the interesting position of being alive for the BCS National Championship game while the Beavers were coming in at 5-5 attempting to salvage a winning record and a bowl berth. After a first half of trading field goals amid a winter deluge, junior Keenan Howry scored the game’s first TD on a 70-yard punt return. After trading a few scores, Harrington lost control of the ball on a quarterback keeper play and nearly gave the game to the Beavers. In the end, though, the Duck defense was able to make a play and hold on for the win, although the closeness of the game unfortunately kept Oregon out of the BCS championship game. Harrington was part of what made Bellotti’s program so great. While Harrington was not Mariota or Norm Van Brocklin, he was still one of the most impressive quarterbacks in Oregon history. Always exciting to watch, Captain Comeback led Oregon to wins in many games that they really shouldn’t have won. The fact is, while he might not have been as flashy as other quarterbacks, Harrington elevated the level of play of everyone around him and made Oregon into a much better team than they would have been without him. With a career record of 25-3 and only one loss in Autzen Stadium, Harrington was a winner, especially in the fourth quarter where he led Oregon back from behind on 10 different occasions. Article inspiration from Tales From The Oregon Ducks Sideline by Brian Libby.